Facing pressure from U.S. authorities, Intrade announced Monday that it will no longer offer "real-money" accounts for users in the United States. 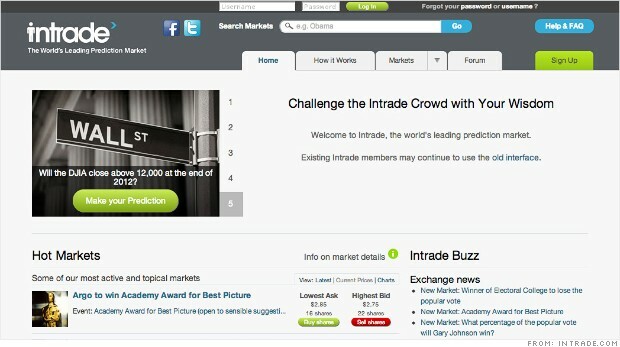 The announcement comes after the Commodity Futures Trading Commission filed a civil complaint against the Dublin, Ireland-based operators of Intrade, an online prediction market. The CFTC charged Intrade and its parent company, Trade Exchange Network Limited, with violating a ban on options trading and making false statements in official filings. "We are sorry to announce that due to legal and regulatory pressures, Intrade can no longer allow U.S. residents to participate in our real-money prediction markets," Intrade said in a statement. "Unfortunately this means that all U.S. residents must begin the process of closing down their Intrade accounts." The company advised U.S. customers to close out open predictions as soon as possible and withdraw all funds from their accounts by Dec. 31. Intrade is a website where users buy and sell contracts that allow them to predict whether a certain outcome will occur, such as the winner of presidential elections, specific acts of war and weather events. "It is against the law to solicit U.S. persons to buy and sell commodity options, even if they are called 'prediction' contracts, unless they are listed for trading and traded on a CFTC-registered exchange or unless legally exempt," said David Meister, director of the CFTC's division of enforcement, in a statement. The CFTC also claims that Intrade and TEN made false statements in regulatory filings regarding its options offerings and violating a 2005 cease and desist order, according to the complaint. The Commission's lawsuit, which was aided by the Central Bank of Ireland, seeks monetary penalties, disgorgement of ill-gotten gains and permanent injunctions against the companies.